TORONTO, Ont. 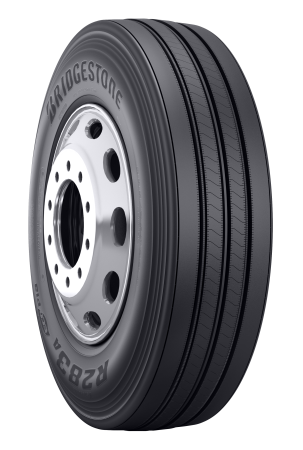 — Bridgestone used Truck World to launch its new R283A steer tire to the Canadian market. The company says the Ecopia tire produces 3% less rolling resistance than the R283 tire it replaces and will offer 21% longer wear life. The fuel savings come from the IntelliShape sidewall design, which uses less bead filler, reducing tire weight by about three pounds, according to Leighton Watkins, regional manager, Eastern Canada with Bridgestone Commercial Solutions. The tire was launched in the US in January and is now ready for delivery in Canada. The Bridgestone R283A Ecopia tire.